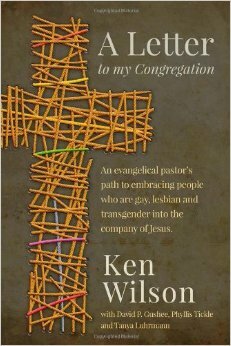 Ken Wilson’s sweet, tight epistle to his evangelical church about his conversion from gay marriage opponent to supporter is not just about acceptance of homosexuality or gay marriage. It’s much more. It’s an expose of how a deeply religious, scripturally bound shepherd of souls confronts a controversial moral issue. For that reason, of the many people I wish would read this book, a surprising group came to mind: those already on board with gay marriage. It seems an odd audience to recommend it to. After all, these are people in agreement with Pastor Ken Wilson at the end of his journey of faith. But the reason they should read it is because his analysis, his prayerful, thoughtful, grace-full listening to his conscience, analyzing scripture and trying to figure out what is the right thing to do puts the lie to a lot of stereotypes of his ilk. He’s not a bigot and never was one, the convenient canard hurled at gay marriage opponents. He’s not a cretin, nor a thoughtless, careless man. He struggles, as we all do, with thorny topics, and his struggle takes place within the context of someone dead serious about religion, serious about following what he believes is God’s will, serious about listening to the “still, small voice” of God. So, please, all of you who were quick to throw the “bigot” charge at gay marriage opponents, who were swift to lump the Ken Wilsons of the world into the same category as that of the hateful Westboro Baptist Church, pick up this book. It’s at least worth a heavy skim, and it will reveal to you the thinking of a man focused on his faith when dealing with controversial topics where competing pressures push at one’s heart and soul. And, of course, the main audience Wilson writes for are all those who, like him, have begun to experience a “fleeting unease,” as he puts it, with the anti-gay marriage stance of their churches. For them, this book will bring solace and enlightenment. Wilson isn’t just any Christian. He’s an evangelical pastor. His colleagues and spiritual friends are people who take the Bible very seriously, who know it well, who seek to lead Godly lives even in ungodly times. They walk to the beat of a different drummer, out of step with most of contemporary society, viewing with sadness the decay of some moral values throughout society. He’s not an I’m-okay-you’re-okay moral relativist, willing to view the Bible as a Rohrschach image in which one can see…whatever one wants. And when he began to walk away from his evangelical compatriots on this issue, he felt the distance acutely, wondering if serving the greater good — his congregation — would require him to be silent on the topic. But Wilson began having doubts about his church’s views on homosexuals as he saw all churches changing views on marriage after divorce, becoming less exclusive, more inclusive. After all, Biblical teaching meant, to him, that divorcees couldn’t remarry. And, early in his career, he turned a cold shoulder to those who sought remarriage, much to his later regret. But his eyes and heart began to open to a message of inclusiveness on this aspect of marriage as he began to view Biblical teaching on marriage as more nuanced, or less dogmatic, than he previously had thought. As he reexamined those ideas, he was also confronted with more gays and lesbians seeking church membership. Yes, Virginia, there are gays who want to join evangelical churches — as one told Wilson, they are seeking “more Jesus” than a mainline Protestant church might offer, despite those churches’ more inclusive attitude toward them. And as Wilson confronted these godly people, he couldn’t fully embrace the “love the sinner, hate the sin” philosophy of his fellow pastors and colleagues. To him, it seemed a “less than” arrangement that implied inequality. It wasn’t welcoming enough. He goes through the scripture passages used against homosexuality and sets them in context, even using the writings of colleagues who are not on the same page with him on this issue to make his broader point — that the Bible is, for the most part, not expansive on the issue of homosexuality, and when it does speak, most notably through the epistles of Paul, context plays a key role in understanding what the writer was really addressing. His heavily footnoted epistle lists the clearly prohibited activities detailed in the Bible and talks about “disputable matters” (which he believes is where gay marriage and homosexuality fall). He covers previous controversies in the early church of Paul between meat-eaters and non-meat-eaters, and how that battle helps shed light on how Paul would want us to view any current similar church-rending issues. Occasionally, when reading a book, I get so excited about it I can hardly wait to share it with people. That’s the way I felt about A Letter to My Congregation. I turned down the corners of so many pages, hoping to find a particularly stirring passage to quote in this review, that I discovered I’d practically marked every single page. Thanks to son Joseph, who recommended this book to me. I read it on the eve of his own wedding to his partner, Jack.